For the creation of a house’s floor plans you need to join the already measured rooms to each other from the individually drawn and measured room polygons. You can join two rooms through their doors or windows. Matching is done through identifying both sides of a wall opening in both rooms containing it. To match two sides of an opening, find both sides of the door in both two rooms, and select them. Tap one side of the door in one of the rooms and hold your finger on the screen and move it to the other side of the door in the other room and release the screen. A window appears where only the wall thickness is to be measured. Here you have the option to pair only the door sides in case the two rooms were already connected through another wall opening. In this case you don’t need to set anything. This tool helps to remove connection between previously matched walls. When you are done with your floor plan, or just want to transfer it in its current state to your PC or Mac for further processing, then you can do it with the use of cloud services like Box and Dropbox. By the first time you try to do it an authorization window will be displayed. Here you can link OrthoGraph Architect to your Box or Dropbox account, which information will be stored on you iPad for later use. After linking OrthoGraph Architect to you Cloud storage account a window requesting a file name is displayed. First choose the required service and file format, than simply enter the name you wish to give to the current project without any extension, and then tap OK or the hide keyboard button on the bottom right corner of your iPad. 1. SRVD OrthoGraph’s own file format, usable together with the CAD conversion tools. This format can be converted to Google SketchUp or can be read using ArchiCAD Import Module. 2. JPG or PNG file format exporting the current view of OrthoGraph Architect. It has a fixed resolution of 768×910 independently of using OrthoGraph in Landscape or Portrait mode. 3. PDF – a Room-book in PDF file format containing the whole floorplan, and all locations with its properties and objects respectively. After uploading the particular file a confirmation window is displayed about its success, and also detailing the possible usage of the uploaded file. 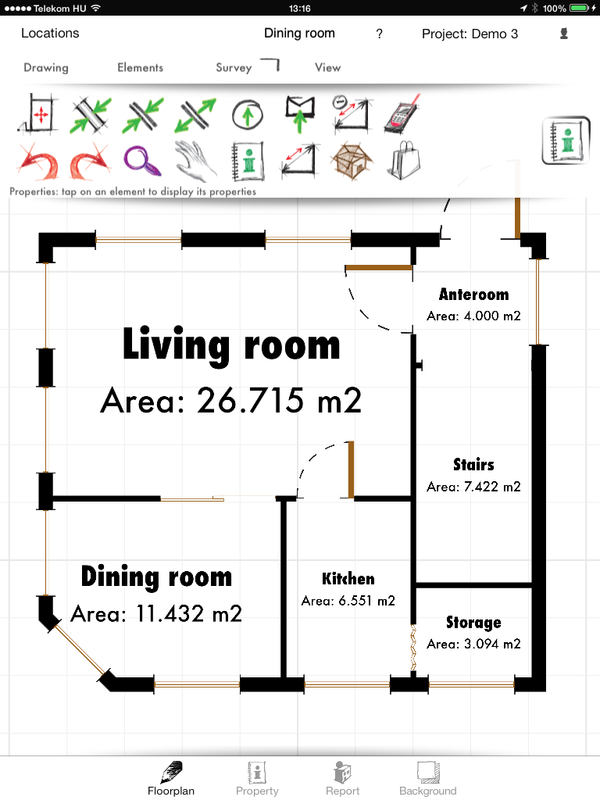 When you are done with your floor plan, or just want to transfer it in its current state to your PC or Mac for further processing, then you can do it via e-mail. After tapping on the tool a window requesting a file name is displayed. First choose the required service and file format, than simply enter the name you wish to give to the current project without any extension, and then tap OK or the hide keyboard button on the bottom right corner of your iPad. 4. IFC – IFC is the standard of professional CAD communication. OrthoGraph creates IFC 2×3 files directly on the iPad. This tool lets you make a point unmeasured. If this function is selected, and you tap a measured point ad swipe your finger away, all measures going to that point will be deleted. OrthoGraph natively supports Leica Disto E7500i/D510 and Bosch GLM 100 C laser distance meters. After tapping on the tool, a window appears showing avaialble Bluetooth devices. Select your distance meter, and from that time iPad and the laser will be connected. Any distance measured by the distance meter will appear on the active window in OrthoGraph allowing an even quicker and more precise work. by image properties tapping the image button in the actual line brings up the currently attached image. If there is no image yet, a gray camera icon appears. Tapping the current image or the camera icon the iPad’s camera turns on, and allows making and then attaching a snapshot from the current view into the particular property.